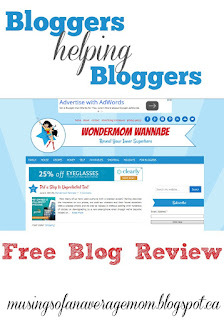 Last weeks chosen blog from the Bloggers helping Bloggers: Blog Review Link Party was Wondermom Wannabe. Congrats! Wondermom Wannabe received eleven reviews from fellow bloggers, and countless compliments on her design and content but I have mainly included the criticisms to show what others feel needs improvement, and also this review would have been three times as long! "I like the image, colour and size of the header"
"The title of your blog is very easy to read and see. My first impression is that the cartoon logo is a little immature, but at the same time I understand the logo and see that it matches your title." "I love the picture of the superhero mom holding the baby." "Not too big; creative and I love the social buttons right up top!" "I think you should have an image and short about me blurb above the search box. And I would like to see some breaks between the advertisements - with popular posts or something more personal, also I think your advertisements should all be similar sizes. The last three ads on the sidebar could probably be side by side." "It's really clean! You have lots of ads on the side. For me it took a few minutes to load the page...maybe due to ads?" "Not much actual content here. I can appreciate the need for ads, and it's good that the subscription box is front and center. However, I would really love to see an actual photograph of this mom. She might be want to be a Wondermom, but it's hard to truly relate to a cartoon." "First, I would love to see a picture of you and some blurb about you. I don't have anywhere to go to see more about who you are, and I want to. I think it would be helpful to add titles in your sidebar. Although there are a few items in the sidebar, I don't understand why they are there. Are they sponsors or rewards of some kind? I think your sidebar could offer more by adding some additional information such as categories, most read posts, etc." "I can find your social media buttons, and they all lead to the correct pages. And I can definitely see where to subscribe- super important, and I think this is well done!" "Your social media icons are front and center which makes it easy to follow. I might like to see a Pinterest widget, but that might be my personal opinion as I am a Pinterest addict." "I found it very easy to pin one of the articles that interested me onto my Pinterest board, using the social media buttons on the left side." "I like all your content, and all the categories in your menu bar. I thought your "about" was too text heavy and needs more line breaks, and also an image of yourself. I find some of your post seem to be short in length, and I would like to see more images for posts like Keeping an Organized Home in which I loved that command center." "You cover a lot of topics- I was drawn to the family meeting planner and I loved your content. You had great ideas about coming together to sort out schedules for the week and I love that you have each member chooses a meal. I find the content informative and well written." "I would also suggest decreasing the number of posts on the front/main page that way they have to go to "previous" pages and that helps with the ads... but to compensate for less content on the first page, add a "favorite post or most popular post or read more" post on the side bar to get readers to see more content. " "... I think the content is varied. There's not all of just one topic covered here. So it's appealing to lots of people!" "I scrolled through the list of latest posts. I found the thumbnails and titles to be "grabby." In other words, they catch my attention and make me curious to read more. (And I will.)" "I also checked out a few of the recipes. They were nicely illustrated. Good instructions and descriptions without being too wordy. Nice printable recap at the bottom. And another great idea: links for searching similar recipes." "I like how informative her writing style is. She adds her own flair and a bit of her own life into her blog posts but without sacrificing content on the post. (I have been known to give up reading a post because it took too long to get past whatever story about the blogger’s kids that was totally unrelated - or even related but just too long - before the actual meat of the post.)" "When I took a look at the content, it seems formatted for bloggers, not the average mom, which could be her market. I don't know. I started by reading her first three blog posts that were not link-ups. 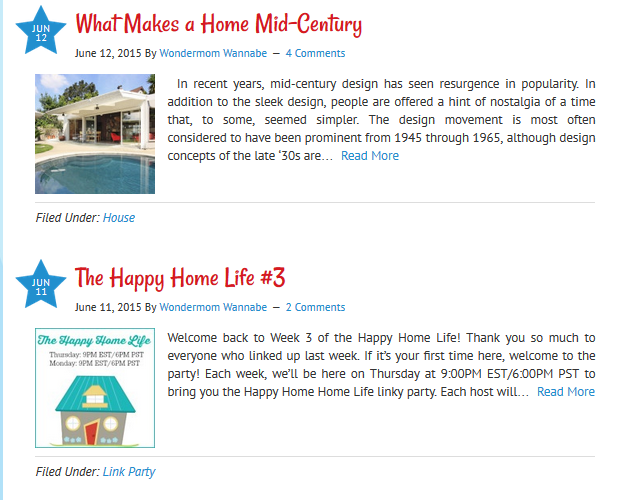 The first was on "Mid-Century Modern Homes," which, being a new-comer to her blog, confused me. I thought this blog was about motherhood. No mention of it here. The next post was a muffin recipe with product placement.Obvious product placement. Not such a big deal. I mean, the recipe looked really good, and this post had my favorite pictures. I assume one of the ladies was the wondermom, but I don't know which one. Anyway, based on this post, I started to get the idea that what she meant by "Wondermom" was "Super-fit mom." That's not what I was thinking by the header. This is where a really good "About Me" widget at the top of the sidebar would come in handy. Who are you? What is this blog about? It's pretty, but I am confused after two posts. So, I look at the third one. About infused water. Cute little post. Still along the lines of fit mom. Then, I go to the family category. Lots of posts about exercise. Yep. Fit mom. Not a bad thing. It just clears up who I am reading about. I am not super into fit moms, so I probably would not subscribe. The thing is, if I was into fit moms, I wouldn't necessarily see it from the beginning. I have to look around to find that. She is probably losing potential subscribers. Still, the personal posts are few and far between. Is your content just sales posts? That's cool and all, but I read blog to get to know the people who write them. I want to know about their lives. I want them to be my internet friends. You don't seem to want to be friends with me. I feel like you just want to sell me stuff. It's the complete opposite of your cool, friendly branding." "I find your main font clear and large enough to read easily, and I also like the headline font and colour." "Your font and size are very easy to read, especially against the white background. Your headings are also easy to spot and read." "Couple things I think could be helpful. First, if I am loving a post that I'm reading, I have to go back to your homepage in order to go to the next post. There isn't a way for me to go from one post to the next (at least, I don't see one). Also,I clicked on the "return to top of page" button at the very end of your post, and it didn't do anything. I was not taken to the top of the page." "Easy to navigate with the search bar first, and clear categories." "I really like the "Filed under" reference on each post that identifies its page. That is a great idea, and I would like to figure out how to incorporate that into my blog." "How easy it is to navigate, and find what you are looking for- It looks well-organized, but I am not sure how well thought out it is. As I mentioned, I can't tell from the beginning what this blog is about. I could tell she was into health/fitness, but the headers for health and fitness are buried in the category titled "Self." Not sure too many ladies are heading to the "self" category. We should be, but we don't. We go to a blog about a mom to look for mom stuff. This is probably why her first category is family, but in family, I see she's a fit mom. Vicious circle." about who is writing the blog. " "I like the overall appearance, the colour choices are a good fit. Think the sidebar might be a bit wide and also ad heavy as I mentioned. Like your footer it's clean and concise." "Your homepage has a wonderful layout! I love that each title is easy to see, and has a small picture and blurb to go with it!" "I think her "above the fold" impression is amazing! It is very powerful! Love that first impression. She has tons of ads, but she has managed to make it look clean and not cluttered. I would suggest adding an "about me" on the page. It's nice to see who is writing. It's a good visual." "Really pretty! It reminds me of a superhero because of the bright, bold colors!" "Overall very clean and organized. Good placement of ads, social media, and categories. The one thing that I would suggest is bringing more YOU to the table- there is no picture of you on your sidebar, or in your about section. There is also no tab about your life. I understand the importance of privacy, but I found myself looking for posts just about your day-to day. I had to click over to your instagram just to see the woman behind the blog. Please show more of your beautiful self!" "I don't know what else to recommend. The site seems so clean and informative, I'm jealous. If anything, maybe remove an ad or two as there are two banners near the top and several in the sidebar." "Here's what I recommend. Put a gorgeous picture of yourself up, and write a little note about who you are and what your blog is about in the side bar. Then, write more about you. After you get some more personal content, re-categorize and sprinkle the sales stuff in those categories. Your stuff is scattered because it is not you. I don't want to read this blog after exploring it. Too sale-sy and not enough personal content. The branding is beautiful and spot on, but I would rather subscribe to a blog that wasn't as pretty, but had sincere content. If that's not your thing. I get it. Some folks want to keep their distance. I am just not sure that you will have a community and a true following this way." "All in all I love this blog site and am glad it was chosen for review for selfish reasons. I now have another site I like a lot to follow. :)"
The reviews were mainly positive but I think everyone suggested they want it to be more personal with personal pictures and an about me. Everyone loved the header and found it very easy to read, and there were different suggestions for improving the organization and arrangement. If you wanted a free blog review of your own blog by numerous fellow bloggers don`t forget to link up to Bloggers helping Bloggers every Tuesdays at 7:30 am EST. Great post! The advice on here is helpful for anyone with a blog! Thanks for sharing!! I think that if we help one another more, we could all have wonderful blogs. This is a great idea as long as the suggestions are made with love. Thanks for sharing this at the #AnythingGoes Link Party. So glad to have you link up Sue! And love linking up at #anything goes every Monday! Thanks for sharing your experience. As a newer blogger this is something that could be hugely beneficial for me, but is equally terrifying. It's great to see how constructive and detailed all the comments were! Everyone's blog is different but I think there are some critiques that we can all apply to our own blog. And everyone has been so great with taking their time to submit well though out comments. Hope you come back Tuesday's at 7:30 am to link up your own blog.